For the baseball stadium in North Carolina, see Calvin Griffith Park. Griffith Park is a large municipal park at the eastern end of the Santa Monica Mountains, in the Los Feliz neighborhood of Los Angeles, California. The park covers 4,310 acres (1,740 ha) of land, making it one of the largest urban parks in North America. It is the second-largest city park in California, after Mission Trails Preserve in San Diego, and the 11th largest municipally owned park in the United States. It has also been referred to as the Central Park of Los Angeles but is much larger, more untamed, and rugged than its New York City counterpart. After successfully investing in mining, Griffith J. Griffith purchased Rancho Los Feliz (near the Los Angeles River) in 1882 and started an ostrich farm there. 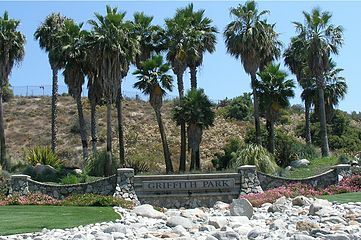 Although ostrich feathers were commonly used in making women's hats in the late-19th century, Griffith's purpose was primarily to lure residents of Los Angeles to his nearby property developments, which supposedly were haunted by the ghost of Antonio Feliz (a previous owner of the property). 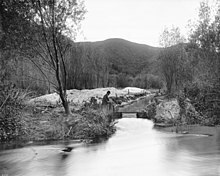 After the property rush peaked, Griffith donated 3,015 acres (1,220 ha) to the city of Los Angeles on December 16, 1896. Griffith was tried and convicted of shooting and severely wounding his wife in a 1903 incident. When released from prison, he attempted to fund the construction of an amphitheater, observatory, planetarium, and a girls' camp and boys' camp in the park. His reputation in the city was tainted by his crime, however, so the city refused his money. In 1912, Griffith designated 100 acres (40 ha) of the park, at its northeast corner along the Los Angeles River, be used to "do something to further aviation". The Griffith Park Aerodrome was the result. Aviation pioneers such as Glenn L. Martin and Silas Christoffersen used it, and the aerodrome passed to the National Guard Air Service. Air operations continued on a 2,000-foot (600 m)-long runway until 1939, when it was closed, partly due to danger from interference with the approaches to Grand Central Airport across the river in Glendale, and because the City Planning commission complained that a military airport violated the terms of Griffith's deed. The National Guard squadron moved to Van Nuys, and the Aerodrome was demolished, though the rotating beacon and its tower remained for many years. From 1946 until the mid-1950s, Rodger Young Village occupied the area which had formerly been the Aerodrome. Today that site is occupied by the Los Angeles Zoo parking lot, the Gene Autry Western Heritage Museum, soccer fields, and the interchange between the Golden State Freeway and the Ventura Freeway. Griffith set up a trust fund for the improvements he envisioned, and after his death in 1919 the city began to build what Griffith had wanted. 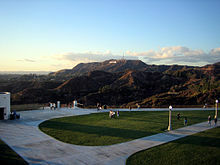 The amphitheater, called the Greek Theatre, was completed in 1930, and Griffith Observatory was finished in 1935. Subsequent to Griffith's original gift further donations of land, city purchases, and the reversion of land from private to public have expanded the Park to its present size. In December, 1944 the Sherman Company donated 444 acres of Hollywoodland open space to Griffith Park. 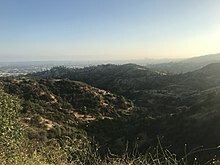 This large, passive, eco-sensitive property borders the Lake Hollywood reservoir (west), the former Hollywoodland sign (north), and Bronson Canyon (east) where it connects into the original Griffith donation. The Hollywoodland residential community is surrounded by this land. After the bombing of Pearl Harbor, the Civilian Conservation Corps camp contained within Griffith Park was converted to a holding center for Japanese Americans arrested as "enemy aliens" before they were transferred to more permanent internment camps. The Griffith Park Detention Camp opened almost immediately after the Pearl Harbor attack, taking in 35 Japanese immigrants suspected of fifth column activity because they lived and worked near military installations. These men, mostly fishermen from nearby Terminal Island, were transferred to an Immigration and Naturalization Service detention station after a brief stay, but Issei internees arrested in the days and weeks following the outbreak of the war arrived soon after to take their place. Up to 550 Japanese Americans were confined in Griffith Park from 1941 to 1942, all subsequently transferred to Fort Lincoln, Fort Missoula and other DOJ camps. On July 14, 1942, the detention camp became a POW Processing Center for German, Italian and Japanese prisoners of war, operating until August 3, 1943, when the prisoners were transferred elsewhere. The camp was changed to the Army Western Corps Photographic Center and Camouflage Experimental Laboratory until the end of the war. Aftermath of the 2007 fire. Both visible and infra-red wavelengths of light have been used to make this satellite image. Vegetation appears in various shades of green, while the burned areas appear charcoal. Hired as part of a welfare project, 3,780 men were in the park clearing brush on October 3, 1933, when a fire broke out in the Mineral Wells area. Many of the workers volunteered or were ordered to fight the fire. In all, 29 men were killed and 150 were injured. Professional firefighters arrived and limited the blaze to 47 acres (19 ha). On May 12, 1961, a wildfire on the south side of the park burned 814 acres (329 ha). It also destroyed eight homes and damaged nine more, chiefly in the Beachwood Canyon area. Another fire occurred circa 1971 in the Toyon Canyon area. Repelled by the ugliness of the devastated area, Amir Dialameh replanted a portion of it himself by hand. Over the course of more than 30 years, he tended the garden he built there with the help of occasional volunteers. On May 8, 2007, a major wildfire burned more than 817 acres (331 ha), destroying the bird sanctuary, Dante's View, and Captain's Roost, and forcing the evacuation of hundreds of people. The fire came right up to one of the largest playgrounds in Los Angeles, Shane's Inspiration, and the Los Angeles Zoo, and threatened the Griffith Observatory, but left such areas intact. Several local organizations, including SaveGriffithPark.org, have been working since then with local officials to restore the park in a way that would benefit all. It was the third fire of the year. The city announced a $50 million plan to stabilize the burned slopes. The trees along Canyon Drive were allowed to grow back naturally, having been re-seeded by bird droppings. One hundred additional acres around Cahuenga Peak were purchased with funds from a broad spectrum of donors, in addition to $1.7 million from the city, and added to the park in July 2010 bringing the park's total acreage to 4,310 acres (1,740 ha). Film pioneer D.W. Griffith (no relation to the eponym of Griffith Park) filmed the battle scenes for his epic Birth of a Nation in the park in 1915, as Lillian Gish detailed in her memoirs, The Movies, Mr. Griffith, and Me. Over the years, a number of films were shot in the park, such as Flareup (1969), starring Raquel Welch. Heritage tree: a pine tree in memory of Beatle George Harrison was planted in 2004 near the observatory. It died after a beetle infestation, and as of 2014, plans have been made to replace it. The site of the Hollywood Sign on the southern side of Mount Lee is located on rough, steep terrain, and is encompassed by barriers to prevent unauthorized access. Local groups have campaigned to make tourist access to the sign difficult on grounds of safety, as the curving hillside roads in the area were not designed for so many cars and pedestrians. The Hollywood Sign Trust convinced Google and other mapping services to stop providing directions to the location of the sign, instead directing visitors to two viewing platforms, Griffith Observatory and the Hollywood and Highland Center. Another, less remote area from which the sign can be viewed is Lake Hollywood Park on Canyon Lake Drive. Much of the park comprises wild, rugged natural areas with hiking and equestrian trails, and this terrain separates the park into many areas or "pockets" of activities. Within the various areas are concessions, golf courses, picnic grounds, pony and train rides, and tennis courts. 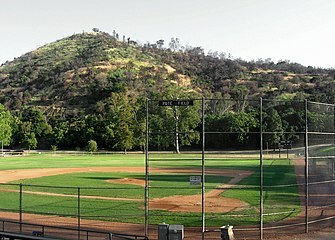 In 2014, two baseball fields were proposed on the east side of Griffith Park that would remove 44 trees and replace four acres (1.6 ha) of picnic area, the largest picnic area in the park that is often used for large family gatherings, cultural fairs and festivals, reunions, and other special occasions. The plan may be altered to spare a sycamore that has been designated by the city as a "heritage tree", a living artifact of Los Angeles history. After its closure in 1966, the grounds of the Griffith Park Zoo were transformed into a recreation area. Some of the former animal enclosures were left in place, and picnic tables were installed. The annual Bell-Jeff Invitational cross country race has been held in the park on the last Saturday in September since 1973. 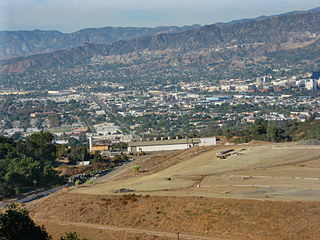 Griffith Park was the busiest destination in Los Angeles for on-location filming in 2011, with 346 production days, according to a FilmL.A. survey. Projects included the TV shows Criminal Minds and The Closer. With its wide variety of scenes and close proximity to Hollywood and Burbank, many different production crews have found new ways and angles to film the same spots and make them look different. One would be hard pressed to find a spot in Griffith Park which has not been filmed or taped. Mount Lee with the Hollywood Sign. It was used for the road scenes in Sunset Boulevard (1950). It was used as a location in the first two Back to the Future movies. In the first movie (released in 1985) it was used for Marty McFly's starting point when accelerating to 88 mph (142 km/h) in the film's climax, and in the second movie (released in 1989) it was used for the "River Road Tunnel" scene when Marty was trying to get the almanac back from Biff Tannen. The same tunnel was used as the entrance to Toontown in Who Framed Roger Rabbit (1988). The park was also featured in the Robert Altman movie Short Cuts (1993). The tunnel was used as the entrance to the NORAD complex in WarGames (1983). The area around the observatory is used extensively in La La Land (2016). The park was the location for Adam Lambert's music video for his single, "If I Had You". 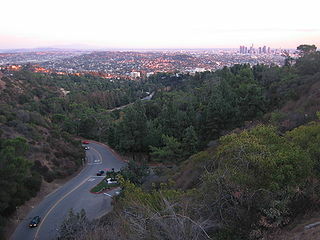 Griffith Park was the location used in Ellie Goulding's music video "Guns and Horses". The silver Trans Am in the Simple Plan music video for Untitled (How Could This Happen to Me?) is seen driving out of the tunnel just before the head-on crash. Bronson Canyon, aka Bronson Caves, is a popular location for motion picture and television filming, especially of western and science fiction low-budget films, including Invasion of the Body Snatchers (1956). The site was also used as the location for the climactic scene in John Ford's classic western, The Searchers (1956). The scene includes John Wayne cornering his niece, Debbie (Natalie Wood), in one of the caves with the apparent intent of killing her. He relents at the last moment, however, and in the film's most famous shot, picks her up in his arms and turns to carry her back home. Many fans of the film are startled by the revelation that this scene was actually filmed in urban Los Angeles, probably due to how well the shot is integrated into the rest of the picture's location scenery. The craggy site of an old quarry, a tunnel in this canyon was also used as the entrance to the Batcave in the opening sequence of the 1960s Batman television series, and in numerous other shows. The natural "cave" walls are preserved by the many layers of paint used to make them look like rock. The Griffith Observatory, which sits atop the southern slope of Mount Hollywood, was featured prominently in the classic Rebel Without a Cause (1955). A bronze bust of the film's star James Dean is on the grounds just outside the dome. Other movies filmed here include The Terminator (1984), Disney's The Rocketeer (1991), The Majestic (2001), Stephen Sommer's film Van Helsing (2004), and Yes Man (2008). The area of the park around the Observatory also appears as a location in the role-playing video game Vampire: The Masquerade – Bloodlines (2004), which is set in Los Angeles. Griffith Park and Griffith Observatory are significant in the Star Trek: Voyager episode "Future's End" (originally aired November 6, 1996). The crew are thrown into the past and Griffith Observatory discovers Voyager. The tunnel was also used in the 1960s spy television series Mission: Impossible. The park is open 5:00 a.m. to 10:00 p.m. All hiking trails and mountain roads close at sunset. 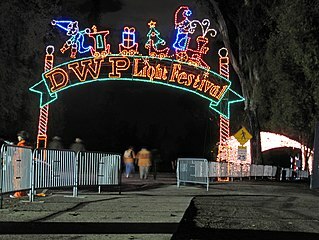 Ample free parking is available on the south side off of Vermont Canyon Road inside the park; cars can be left parked at the parking lot next to the Greek Theater until 10:30 p.m., even though the park gates close to entering cars at sunset. One adult mountain lion is known to inhabit the park. An image of the cougar (known as P-22') was captured on an automatic camera. Permanent signs on the Griffith Park Observatory deck warn of rattlesnakes in the surrounding area. Much of the exposed rock in Griffith Park is marine or non-marine sedimentary rock of Neogene and Quaternary formations, including the Lower, Middle and Upper Topanga, as well as the Monterey and Fernando. Both inclined bedding and fossil-bearing strata are common. Also present is late Miocene intrusive rock, generally strongly weathered and easily cleaved, as well as some dikes and purple and grey andesitic extrusive rock bodies. Faulting as well as clear contacts between rock bodies are also common. Sunset at Griffith Park, with a view of west Los Angeles. Golden Gate Park, San Francisco, California, U.S.
^ a b "Griffith Park". ^ "The 150 Largest City Parks" (PDF). The Trust for Public Land. ^ Hyperakt (March 10, 2018). "On the Grid : Griffith Park". On the Grid. ^ "Best Family-Fun Activities At Griffith Park". June 28, 2017. ^ "Griffith Observatory & Griffith Park Los Angeles". www.travelonline.com. ^ "Gift To Los Angeles: Capitalist G. J. Griffith Donates as a Christmas Present a Magnificent Park Site" (Volume 81, Number 17, Page 3). Los Angeles Herald. December 17, 1896. Retrieved November 17, 2015. ^ a b Masumoto, Marie. "Griffith Park" Densho Encyclopedia. Retrieved 13 Jun 2014. ^ "The Fire of '33", Glendale News-Press, October 1–4, 1993. Accessed May 8, 2007. ^ "Amir's Garden - Since 1971". Amirsgarden.org. Retrieved February 17, 2016. ^ "Hugh Hefner Saves The Hollywood Sign". Beverly Hills Courier. Retrieved June 3, 2010. ^ It's Official: Griffith Park Grows by More than 100 Acres with Addition of Cahuenga Peak Archived May 10, 2012, at the Wayback Machine. LAist (June 18, 2010). Retrieved on August 25, 2013. ^ "Griffith Park". City of Los Angeles Department of Recreation & Parks. Retrieved March 10, 2016. ^ Lewis, Randy (July 21, 2014). "George Harrison Memorial Tree killed ... by beetles; replanting due". Los Angeles Times. ^ Lewis, Randy (February 20, 2015). "George Harrison tree -- killed by beetles -- to be replanted Feb. 25". Los Angeles Times. ^ Bob Pool (October 8, 2013). "Discontent brewing under the Hollywood sign". Los Angeles Times. ^ Bob Pool (October 9, 2013). "Hollywood sign tourists, sightseers annoy local residents". Los Angeles Times. ^ Walker, Alissa (November 21, 2014). "Why People Keep Trying to Erase the Hollywood Sign From Google Maps". Gizmodo. Retrieved November 21, 2014. ^ Sahagun, Louis (September 12, 2014). "Plans to add baseball fields to Griffith Park may draw legal challenge". Los Angeles Times. ^ "Big Field Expected for Bell-Jeff Invitational". latimes.com. Retrieved September 4, 2018. ^ "Top Film Locations for 2011". Los Angeles Times. December 15, 2011. ^ Steve Winter, Ghost Cats, National Geographic, December 2013. ^ "P" for puma, another name for mountain lion, and "22" as he is the 22nd of his species which has been tracked by local National Park Service rangers. 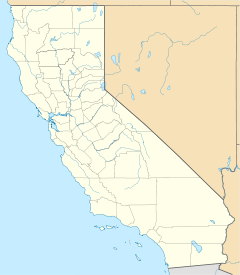 ^ "LA's Mountain Lion Is A Solitary Cat With A Knack For Travel". NPR. April 19, 2015. Retrieved April 20, 2015. ^ Nijhuis, Michelle (April 20, 2015). "The Mountain Lions of Los Angeles". The New Yorker. ^ Hicks, Reva (May 23, 2012). "Rattlesnake Warning: They're Shy, but Dangerous". NBC Southern California. Retrieved March 20, 2019. the Southern Pacific rattlesnake [is] found in Griffith Park -- a place where humans, dogs and rattlesnakes share the trails. ^ Helman, Daniel (2012). "Public Geology at Griffith Park in Los Angeles: A Sample Teachers' Guide". Electronic Green Journal. 1 (33). Retrieved August 18, 2018. 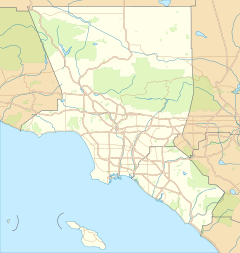 Wikimedia Commons has media related to Griffith Park.